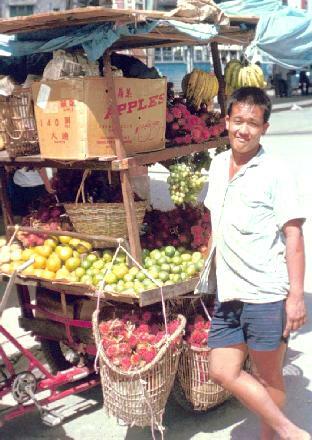 A fruit vendor in Sibu. His stand is built on a cargo bicycle. A cargo bicycle was like a pick-up truck in reverse. The front had two wheels with a platform between them. The tires were heavy-duty and the gears low. They could carry several hundred pounds.